An egg based dish stuffed with spicy Italian sausage and sweet roasted red peppers that is topped with a tasty marinara sauce and melted cheese. After a week of decadent experiments with my cinnamon swirl bread for breakfasts, I was looking for something a little on the lighter side for this week. When I am thinking about healthier breakfasts I often go for eggs and as luck would have it I had been meaning to try something new with a frittata. A frittata is an egg dish that is similar to an omelette that is cooked in a pan on the stove top until the eggs have set on the bottom and then it is transfered to the oven to finish cooking and get a nice golden brown top. Like an omelette, the frittata is generally filled with something be it cheeses, meats or vegetables. 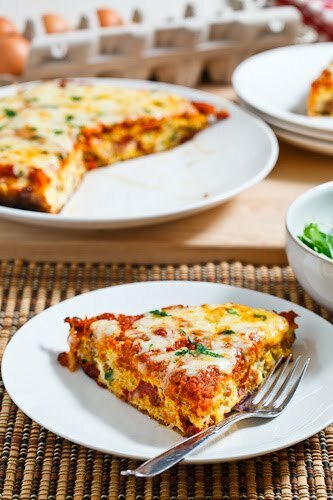 Although I normally focus on the flavours of the filling I had recently come across the idea of topping the frittata with something, namely a marinara sauce and melted mozzarella cheese in this recipe for a red pepper and Italian sausage fritata from Our Life in Food that immediately caught my attention. This frittata is pretty simple with most of the flavour coming from the spicy Italian sausage and the sweet roasted red peppers along with a bit of parmigiano reggiano cheese. I went with a home made marinara sauce to which I added a touch of ground fennel seeds to complement the flavours of the sausage and everything was topped off with some mozzarella cheese. My expectations for this frittata were pretty high, I mean if you take an already amazing frittata and cover it in a tasty marinara sauce and then smother it in ooey gooey melted cheese, you just have to have a winner! Even with those high expectations, I have to say that this is definitely the best frittata that I have ever had! The marinara and mozzarella topping works really well on a frittata adding a ton of flavour and keeping things nice and moist. I am certainly looking forward to breakfasts this week! Heat the oil in an oven proof pan over medium heat. Add the sausage and cook until it has just browned all over, breaking it apart as you go. Mix the eggs, parmigiano reggiano, roasted red pepper, sausage, onions, garlic, salt and pepper in a large bowl. Transfer the pan into a preheated 400F/200C oven and let the eggs finish cooking, about 10 minutes. Pour the marinara sauce over the frittata, sprinkle on the cheese and broil until the cheese has melted, about 2-4 minutes. Serve immediately, garnished with chopped parsley. Yum! It looks amazing as usual. Love your food styling! Oooo how delicious! Will put this on my list to cook this week. I love this idea of topping the frittata with marina and cheese! It sounds great to me. This kind of reminds me of a pizza but in frittata form! Delicious! And definitely perfect for lightening up! that looks amazing. I think I may attempt this one tonight. Looks delicious! Adding garlic is such a great idea. I love learning new frittata recipes. This looks awesome. I love frittata. This is so rich and decadent. Would have to share! Looks amazing! I bet this was a fantastic frittata. Sounds amazing! Breakfast for dinner is great, and this is a hearty and delicious way to have it! Yum, this was delicious. Great recipe! Made this this morning, so delicious! Tasted a bit like pizza with the marinara sauce and mozz. Fantastic! Anonymous: To make this as a frittata you cook it part way on the stove top in the pan and then finish it in the oven. You could cook it completely in the oven in a baking dish, more quiche like, and it would be just as tasty. I would bake it at 350F until the eggs have set, about 25-30 minutes. Enjoy! I made this for dinner the other night and loved it! It almost reminded me of pizza even though it was eggs. This was absolutely delicious! The only change I made was to add a shallot because I have TONS of them right now. I took some leftover for lunch the next day. When a coworker walked in to our lunchroom she said “Wow! It smells so good in here!” I agree…it tastes a lot like pizza…but with eggs instead of crust so, less carbs!